As part of Saatchi & Saatchi's marketing campaign for Toyota, five 18-foot Prius Solar Flowers were plopped onto a pedestrian plaza north of the Flatiron Building last week. 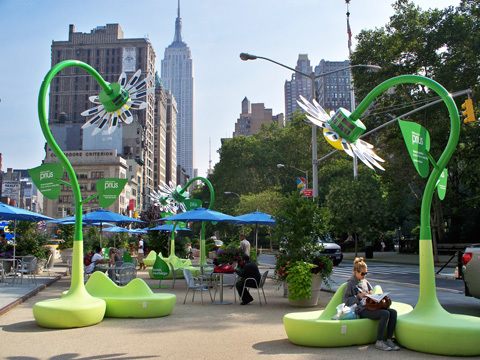 The flower sculptures are "partially" powered by solar panels on the back of their petals — outlets are built into the base. Stop by, sit down, surf, plug in and recharge 'til August 2nd in NYC.